Curved to accomodate a twin, this Arkansas doubly-terminated crystal exhibits both a multi-green chlorite phantom and a quite rare dogtooth shape. Two opposing sides are markedly less wide than the other four, giving the crystal nearly a diamond shape when viewed from either termination. The twinned end, with a sea-green phantom, actually has three main faces - possibly from an old contact. A second, see-through green phantom has darker borders and bluntly illustrates a bit of interrupted growth pattern, leading to a tiny tip chip at the channel faced end. 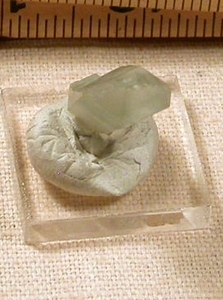 1/4x 1/2x 1-3/8", a 'rare and unusual' crystal.